Many companies are overwhelmed at the prospect of creating and installing a cleanroom space. Our prefabricated modular structures are designed to meet all Class needs. With years of experience, we understand how important it is to use the right wall systems and cleanroom components. You can rest easy, when you use Panel Built, because our cleanrooms will hold up to the strictest industry standards. When you need cheap modular cleanrooms for sale, Panel Built should be the first place you shop. We know how important it is to provide the highest quality of standards so your products stay safe. Let us help you get your clean room up and running today. No matter what you need your cleanroom for, you need a company that can guarantee a quality product. With 20 years of experience in the industry, we know exactly how to help. We keep up on the latest industry standards and work hard to provide you with the best product available on the market. 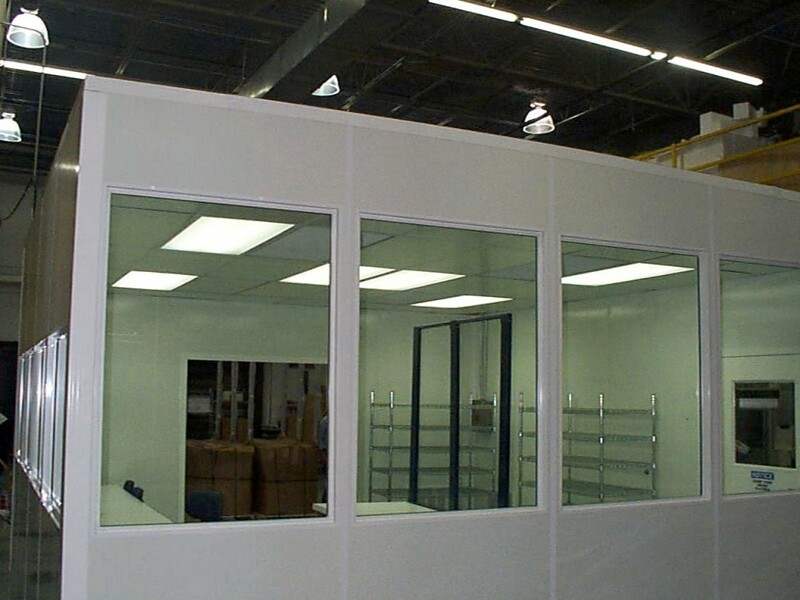 Our customized cleanrooms include a hidden air chase system. By using the wall cavity alongside return louvers, we have eliminated the need to invest in expensive ductwork. You will not even need to worry about chase walls. This feature will save you time and money on your finished room. The modular units are easier to install and cheaper to build. Finding wall systems for modular cleanrooms available online, can be tricky. But each of our units includes everything you need to ensure that your cleanroom is up and running to the highest possible standards as quickly as possible. When you need the best available modular cleanroom mezzanine, look no further. Our mezzanine structures are simple to put together. Most of the items used to make your cleanroom are built off site in bulk. This allows us to provide cheap available ISO 6 cleanrooms for sale. We pass our production savings on to you! But, those savings will not cost you anything in quality. Our rooms come equipped with industry standard windows, doors and vents to ensure the best environment possible. At Panel Built, we work with our suppliers to ensure that you have the highest quality seals, gasketed light fixtures, drop ceilings and fan filter units. We communicate with our suppliers regularly to ensure that we always have the supplies you need for your clean room on hand. Class 1,000 cleanroom: Per standards, the air quality in a class 1000, cleanroom contains less than 1,000 particles of contamination per cubic foot. You can rest assured that your products and equipment will be safe in our modular structures. This is the equivalent of an ISO 6 cleanroom. Class 10,000 cleanroom: Per similar standards, this room cannot have any more than 10,000 particles per cubic foot. We know that levels even slightly higher than recommended can cause significant damage to sensitive products, so we work to ensure you have the most secure products available. When properly paired with appropriate caps, booties and smocks, this environment is secure. This space is the equivalent of an ISO 7 cleanroom. When you need to find companies that sell prefabricated non-metallic cleanrooms, check out Panel Built. We can provide the safest environments for all of your cleanroom needs. We want to make your job easier. When you need a modular cleanroom mezzanine or prefabricated non-metallic cleanrooms, we can help. We can help make your job easier by providing a structure that is ready to install. All of the parts you received meet or surpass required standards for industry cleaning rooms. Although we can provide wall systems for modular cleanrooms, we are happy to work with your mechanical contractor too. Our technicians can provide the necessary information for designing and installing the HVAC system with your clean room. If you don’t have a contractor, we can help there too. Our technicians are licensed to help design and install any HVAC system for your clean room. Let us help you save space, time and money when you purchase a cleanroom online. When you order a pre-built cleanroom system, you will save time and reduce the impact on your work environment. When you place an order with us, we collect everything you need to put your cleanroom together. You will not have to worry about much onsite construction, except for HVAC system requirements. Once your cleanroom arrives, we can help you connect it to your air system and get you set up quickly. The ability to provide everything you need from an offsite source saves you money and man power. Additionally, because of the reduced construction, there will be less traffic to and from your industrial building, which reduces your impact on the environment. We can help as little or as much as you need us. Panel Built works hard to provide the best quality customer service. We want you to be happy with your product. We can help you get the structures or rooms you need with little hassle, less money and a better customer service. Check out our website to learn more about the different systems we offer. We know we can help you save time and money on your cleanrooms and other modular systems.